These are plane figures which just have measurements like length and breadth. These are solid figures which have measurements like length, breadth, height. Example: Cube, cuboid , etc. 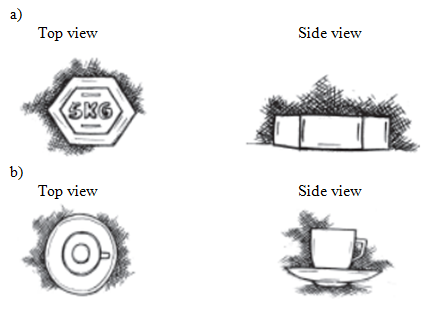 Any 3-D object when viewed from different positions might appear different. Example 1: Look at different views of glass from different positions. 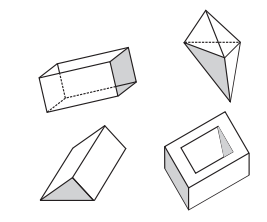 Example 2: Look at different views of solid made of four cubes. 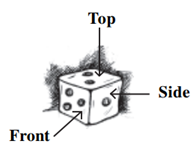 It is a figure which depicts the location of an object with respect to other objects. (a) Symbols are used in maps to represent different objects, places, etc. (b) Size of objects remain proportional to their actual size and not on the basis of perspective i.e. it does not make difference in size of object if its nearer of far from the observer. (c) A scale is pre-fixed for every map. All the lengths are then drawn relative to that scale. 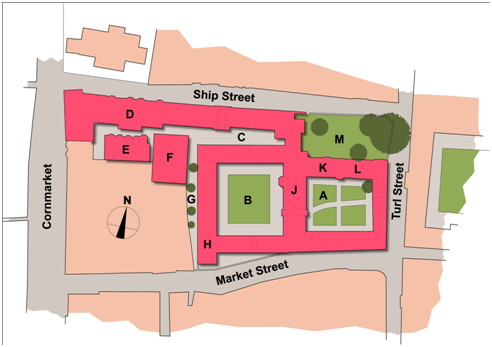 Example: Figure below shows a map for a particular college. 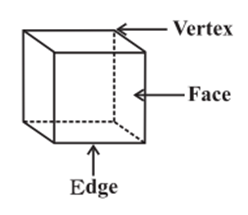 Faces, Edges& Vertices: (a) Face : These are the plane figures of which solids are made. (b) Edge : These are the line segments where faces meet. (c) Vertices/Vertex : These are the points where edges meet. All solids which have faces, edges and vertices are called polyhedrons. 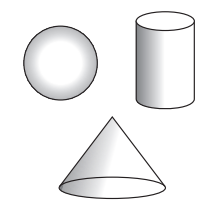 Those solids which either does not have faces, edges or vertices are called non - polyhedrons. A polyhedron in which the line segment formed on joining any vertices lies completely inside it is then such polyhedrons are called convex polyhedron. A polyhedron in which even if one or more line segment formed on joining any vertices lies outside it then such polyhedrons are called concave polyhedron. A polyhedron in which each face is a regular polygon and has same number of faces as vertices is called a regular polyhedron. A polyhedron which is not a regular polyhedron called irregular polyhedron. 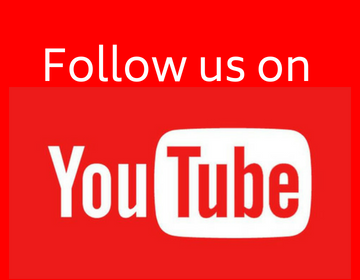 It is a polyhedron in which base and top are the congruent polygons and whose sides are made of parallelograms. It is a polyhedron whose base is a polygon and the lateral faces are triangles with a common vertex. As per Euler, every polyhedron will satisfy the criterion F + V – E = 2, where F is the number of faces of polyhedron, V is the vertices of the polyhedron and E is the number of edges of the polyhedron. Example 1: Using Euler’s formula, find the number of faces if the number of vertices are 6 and the number of edges are 12. Solution: Given, V = 6 and E =12. Example 2: Is it possible that a polyhedron have 10 faces, 20 edges and 15 vertices? Solution: Given, F = 10, V = 15 and E = 20. We know Euler’s formula, F + V – E = 2. If any object satisifies the formula, then it is a polyhedron. So, let’s check it for given values. Here, LHS ≠ RHS, thus it is not possible to have such polyhedron.